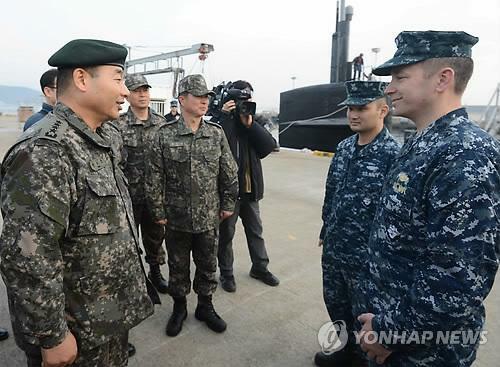 A U.S. nuclear-powered submarine arrived in the southeastern port city of Jinhae for joint naval drills with South Korea, military officials said Friday, in a move seen as a warning to North Korea ahead of what may be an imminent nuclear test. 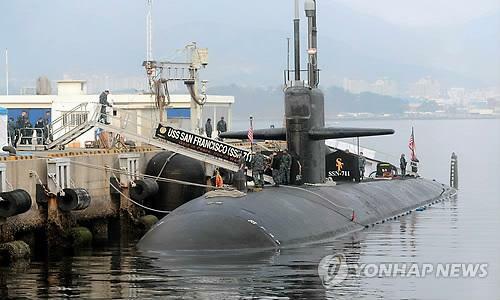 USS San Francisco (SSN-711), a 6,800-ton Los Angeles-class submarine, has been anchored at a naval base in Jinhae, 410 kilometers southeast of Seoul, since Thursday to prepare for joint drills slated for next week, the Joint Chiefs of Staff (JCS) said. A 9,800-ton cruiser equipped with missiles and torpedoes as well as naval combat helicopters also arrived in the southern port city of Busan, on the same day, it said. The port call came as tensions rose on the Korean Peninsula after the North last month warned of a nuclear test in response to the U.N. Security Council’s increased sanctions on Pyongyang for its December rocket launch. A new nuclear test would mark the North’s third since two previous tests in 2006 and 2009. The two U.S. ships and 10 Korean warships, including Aegis destroyers and battle ships, will carry out the joint exercises in the East Sea to test combat readiness between the two sides, the JCS said, though a specific date has not yet been confirmed. In a visit to the naval base in Jinhae, JCS Chairman Jung Seung-jo said Thursday the North has nearly completed its preparations for a nuclear test at its Punggye-ri testing location, noting increased activity spotted by satellites near the nuclear site. “The upcoming drill, which had already been planned, is not targeted for (North Korea’s) nuclear test,” Jung told reporters, adding that the exercise is aimed at coping with possible North Korean provocations involving submarines. Jung did not elaborate when the two sides had agreed on the exercise plan. Military officials in Seoul expect the exercise will show their determination to respond sternly if the communist nation defies a chorus of international warnings. “Although it is a pre-planned exercise, this upcoming joint drill will send a message to North Korea that any misbehavior will not be overlooked,” the official said, asking for anonymity due to sensitivity of the issue. After the North warned of “substantial and high-profile important state measures,” senior military officials have visited front-line units to order vigilance in an effort to add pressure on the isolated state to drop the test plan, which is feared to raise tensions on the Korean Peninsula. In a meeting with top security ministers Thursday, President Lee Myung-bak warned of “grave consequences” if Pyongyang moves forward with the test, urging the defense minister, spy chief and national security advisers to maintain strong military preparedness against any provocations from the North. About 28,500 American troops are stationed in South Korea as a deterrence against North Korea, after the 1950-53 Korean War ended in a truce, not a peace treaty. This entry was posted in US Submarines and tagged South Korea, USS San Francisco on February 1, 2013 by jasonlockley.